While getting a tan on the beach isn’t a sporty activity, there are plenty of ways to stay active and healthy while vacationing on Cape Cod, either in a hobby that you enjoy and are well-versed at or while learning a new skill. Parasailing. Does the idea of flying through the air, attached to a motorboat, appeal to you? Then try parasailing during your Cape Cod vacation. Whether you have parasailed before or you are a first-timer, parasailing is a great activity and well-worth a shot. There are several places to go parasailing on Cape Cod, including Dennis Parasail and Jet Ski located at 1372 Route 134, South Dennis next to the Lost Dog Pub (phone 508-385-8359), Dennis Parasail and Jet Ski asks parasailers to arrive 30 minutes before their reservation. Parasailers will be shuttled for free from the office to the beach so they don’t have to pay for parking. For reservation info, click here. Cape Cod Parasail and Jet Ski takes reservations for parasailing from Memorial Day through Labor Day. Their phone number is 508-398-7245 and they have two locations, one at the Red Jacket Resort at 1 South Shore Drive in South Yarmouth and the other at the Blue Water Beach Resort at 291 South Shore Drive in South Yarmouth. Provincetown Parasail is located on MacMillan Pier in Provincetown and their phone number is 508-487-8359. Kiteboarding. This intensive sport combines wakeboarding, windsurfing, paragliding, gymnastics, and surfing for some serious fun. Air Support (located at 109 Main Street [Route 28, Windmill Plaza] in West Dennis) offers not only kiteboarding, but lessons for those who want to try to get into this extreme sport! Call 508-332-6031 or e-mail info@kitecod.com for more information. Fun Seekers of Wellfleet also offers kiteboarding instruction. Call 508-349-1429 for more info or e-mail info@funseekers.org. Stand-Up Paddleboarding. This fun sport has been gaining popularity and it is easy to see why! While SUP requires some athleticism, it can also be quite relaxing, especially if you go out on a calm pond. Click here for SUP outfitters on Cape Cod. Sailing. What could be better than the wind in your sails? Not much, that’s what. Catboat Rides of Hyannisport (phone 508-775-0222) offers various excursions both private and public, so call them for more info or visit their website by clicking the above link. Cape Sail of Brewster offers lessons and charters. Call 508-896-2730 or e-mail bobrice@capesail.com for more info. Sail Cape Cod of Hyannis offers community sailing. For more information, e-mail info@sailcapecod.org. Outer Cape Sailing of Wellfleet has a plethora of options, from charters to lessons, to choose from. Call 508-237-4012 or e-mail captain@outercapesailing.com for more info. Cape Cod Sailing School of Cataumet offers lessons to those who don’t yet have their sealegs. Call 508-241-6275 or e-mail mark.barrett@capecodsailingschool.com for more info. There are many other spots to rent equipment from or take lessons from, and they are listed here. Kayaking. Whether you enjoy kayaking that is relaxing, such as around ponds and estuaries, or you like a bit of a challenge on the ocean, there are places to help you out on Cape Cod. There are many places to rent kayaks on Cape Cod, and many of them are listed here. Swimming. If you want to get out without hauling a bunch of equipment, then consider going for a swim at one of the many fabulous beaches on Cape Cod. Whether you like the rough and tumble ocean, the calmer bay, or the serenity of a pond, there are plenty of great spots to go for a dip. Jet Skiing. If romping over waves and getting tossed about on the open sea sounds more your speed, consider jet skiing. Cape Cod Parasail and Jet Ski has two locations, one at the Red Jacket Resort at 1 South Shore Drive in South Yarmouth and the other at the Blue Water Beach Resort at 291 South Shore Drive in South Yarmouth. Their phone number is 508-398-7245. Dennis Parasail and Jet Ski located at 1372 Route 134, South Dennis next to the Lost Dog Pub (phone 508-385-8359), also has jet skiing. Aquasport, located at 1 Lighthouse Inn Road in Dennis (phone 508-398-5387) has jet skiing as well. Cape Cod Windsurfing of 350 Quaker Road in North Falmouth (508-801-3329) also rents jet skis. Surfing. With big breaks, especially off the National Seashore, it is no wonder that surfing is a popular summer (and even winter!) pastime on Cape Cod. Nauset Surf Shop is located in Jeremiah Square on Route 6A in Orleans and their phone number is 508-255-4742. They have rentals and lessons. Pump House Surf Shop is located at 9 Route 6A in Orleans and their phone number is 508-240-2226. They offer rentals and lessons. Boarding House Surf Shop, located at 354 Main Street in Hyannis (phone 508-778-4080), is perfect for all boarding needs (surf, skate, and snow). Sickday Surf Shop of Wellfleet (phone 508-488-9283), has equipment and lessons. Windsurfing. While windsurfing requires quite a bit of strength and talent, it can be easier than some of the more extreme water sports and it is loads of fun. Cape Cod Windsurfing of 350 Quaker Road in North Falmouth (508-801-3329) gives lessons in windsurfing and SUP. Sailworld Cape Cod, located at 139 Main Street in Buzzards Bay (phone 508-759-6559) offers rentals and lessons. Fun Seekers of Wellfleet also offers windsurfing lessons. Call 508-349-1429 for more info or e-mail info@funseekers.org. Scuba Diving. There are lots of interesting things to see on the ocean floor surrounding the Cape and Islands. If you are the adventurous type, consider suiting up and seeing what’s down there. Aqua Center at 2 Freezer Road in Sandwich (phone 508-888-3444) offers diving instruction and also leads dives. Cape Cod Sea Sports of 195-D Ridgewood Avenue in Hyannis (phone 508-790-1217) does not offer classes, but they do sell and repair scuba and snorkeling equipment. Don Ferris Dive Training does not offer equipment, but they do have private and semi-private lessons for those who want to learn how to plunge the depths! For more information, call 508-833-8784 or e-mail don@donferris.com. Adventure Diving Services of Cape Cod, located at 590 Locust Road in Eastham, offers instruction as well as equipment and rental services. Call 508-237-5897 or e-mail advdivg@gmail.com for more info. Cape Cod Shark Adventures not only offers shark viewing tours and whale and seal watching, but they also offer the opportunity to get up close and personal with the sharks that dwell of the waters of the Cape. They offer open water dives, as well as cage dives, depending on your comfort level. Divers do not have to be scuba certified, as all dives are snorkel-based. Call 305-395-9140 or e-mail capecodsharkadventures@gmail.com for more info. Of course, it should be noted that many of the resorts in the area offer some of the activities listed above and have their own private instructors. If you are staying at a resort hotel, check with them to see what they offer. 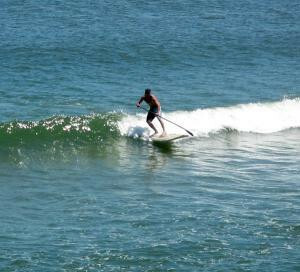 Enjoy an exhilarating workout while stand-up paddleboarding on Cape Cod, here at Lecounts Hollow in Wellfleet. Photo by Maggie Kulbokas. A Weekend in Upper Cape Cod for History Buffs Winter Wildlife on Cape Cod Town Spotlight: Brewster Choosing a Church for Your Cape Cod Wedding Giving Tree : "Our Own Garden of Eden"